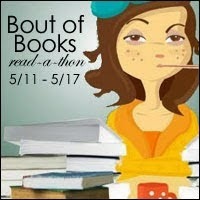 Bout of Books starts on Monday, May 11th and goes through Sunday, May 17th. My goal for the Bout of Books 12.0 TBR pile is to read 250 pages per day, which amounts to 1,750 pages for the whole week. With a crazy week ahead, I am still excited to participate in Bout of Books. This is my favorite read a thon to be a part of - like they say it is casual and you are only challenging yourself at your own pace.